Slack, slack, slack! There's no other way to describe the paucity of posts. Sure there's been lots of busyness but that's no excuse. 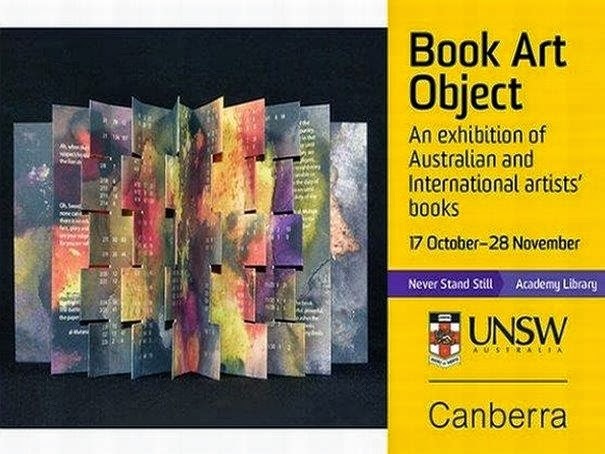 I'll try and do a bit of a catch up over the next few days, starting with the BookArtObject exhibition that opened a few weeks ago at UNSW Canberra. Co-curated this one with Ampersand Duck who has written about it here with lots of photos here. The exhibition's 'poster child' (left) is Making Bread (not bombs), a fabulous flag book by Canadian artist Tara Bryan. 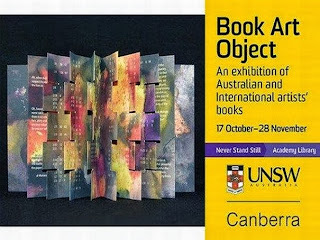 The exhibition runs until 28 November. I've been very slack too, with just about everything, including everything blog-related. Belated thanks for co-curating the show. I couldn't come see it, since I'm on another continent, but was delighted to have my books included. It's obvious from the pictures (and the rave review I got from a friend in Canberra who is not a bookmaker) that you both did a great job with it. It must've been a lot of work. Thank you.